New developments in spherical video shown at last week's CES may have given the format, which blurs the line between real and virtual worlds, the push it needed. 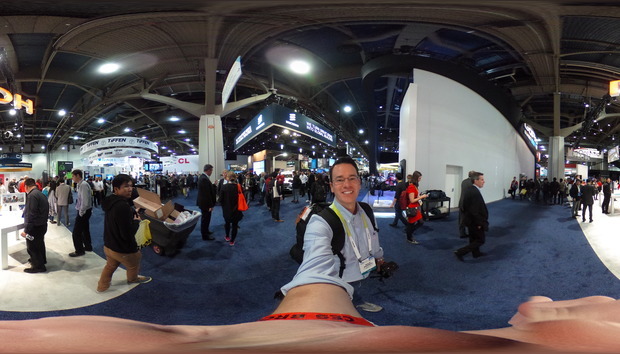 Next generation 360-degree cameras will have higher resolutions and better audio quality, according to Jim Malcolm, president of Ricoh Imaging Americas, maker of the Theta S. The Theta S can shoot 360 video, but the video quality needs improvement. 360 or spherical video began to go mainstream starting around the middle of last year, and it is poised for greater growth in 2016. It's video that is shot in all directions, typically with multiple cameras, creating an interactive final product that immerses viewers. Facebook and YouTube are the only sites that display user-generated 360 video. In the desktop experience, viewers can use a mouse to scroll around a 360 video. On mobile they can move their phones to explore virtual worlds. Creating good spherical video is wrought with technical and financial challenges. Nokia debuted the Ozo camera, which is designed for professional filmmakers with a price tag to match at $60,000. There's the GoPro Odyssey that uses Google Jump and 16 GoPro cameras for $15,000. In the sub-$1,000 space there are only a few players. Ricoh is one of them, with the relatively affordable Theta S for $350. It uses two cameras to shoot video which is then stitched together on an iOS device (Android is coming soon according to Malcolm) or desktop software before being sent to YouTube or Facebook. The Theta S creates a full HD (1920 x 1080 pixels) video file, but when viewing it in a spherical player you're only seeing a sliver of the video. Effectively what you're viewing is an image that is at or less than standard definition quality. Malcolm wouldn't reveal a timeline, but said that the next versions of the Theta will be higher resolution and have better audio. Ricoh's leadership in the consumer 360 space will be challenged as GoPro enters. "We're going to be releasing a smaller, more consumer-friendly spherical capture device," said GoPro CEO Nick Woodman during a CES keynote. He didn't specify a timeline. Malcolm said one of the drawbacks of the Theta S is that it is not rugged or waterproof. He said that the next models should be. That's an important contrast to GoPro, which ships its cameras in a waterproof, sporty housing. While spherical videos are easily viewable on desktop and mobile, a better way to watch them is with virtual reality googles. Google Cardboard is a low cost way to consume VR content using a smartphone. Cardboard devices ship flat and then can be made into a VR viewer that has a slot for your smartphone. A pair of lenses marries the split screen video and the phone's gyroscope tracks head movement, adjusting the image accordingly. Cardboard, which only costs a few dollars not including a phone, is a much more promising way to democratize virtual reality content than the $600 Oculus Rift. The New York Times shipped one million Cardboards so that subscribers could watch VR content created for it. "[Virtual reality is] a way to experience other people's lives and experiences in a manner never possible before," Woodman said. "Days or weeks later when you recount your viewing experience it becomes difficult to discern whether you watched it or you lived it."